Location based social networks are the current darling of social media. Foursquare is leading the way with what seems like a new Fourtune 500 endorsement each week. It is unclear where all these tools will lead us. Foursquare, Gowalla, Whrrl, and even MyTown are getting a lot of attention and a lot of businesses, big and small, are experimenting. So let’s take a moment and capture what all has been done with these tools to date. How are big brands testing the space? What are brick and mortars playing with? Nothing earth shattering here, but the more businesses experiment in the space, the more we all learn. 1. Starbucks Offers Nationwide Mayor Special – Starbucks extends local store mayor specials to all it’s stores with a single $1 frappuchino coupon for any Starbucks mayor at any Starbucks. 2. BART San Francisco Transportition – BART, the Bay Area Rapid Transit offered “a BART-themed badge that can be unlocked by regular riders of BART, which provides train service in the San Francisco Bay Area. BART awarded $25 promotional tickets each month for the next 3 months to riders chosen at random from all the riders who have logged Foursquare check-ins at BART stations, starting in November, 2009.” The goal of the promotion was to embrace Foursquare use on BART already and to further encourage use of public transit. 5. The History Channel Sprinkles Historical Facts All Over – The History Channel created tips on Foursquare that share historically significant facts with users when they check into a location of note, for instance the first building that bought an Otis elevator. 6. Eat Free at Golden Coral – The Foursquare mayor can eat free once per day. Check ins on other location services give you a chance to eat free as well as a chance to win an iPad as part of a larger contest than the daily eat free special. 7. Hubspot’s Virtual Check In at SXSW – At SXSW 2010, Hubspot did not have an exhibitor booth, but they did set up a check in spot at the SXSW convention center and added tips for folks to check out their Foursquare Grader and Speaker Grader tools. 8. College Basketball T-shirt Giveaway – UNC Charlotte, the first college/university to implement location based social network special on campus, offered free t-shirts to students that checked in at certain basketball games and other events. 9. Harvard Fully Embraces Location – Harvard encouraged students to rate campus venues, share tips, and work to earn the Harvard Yard badge by checking in to a certain numbers of locations. They also left tips at locations on and off campus for students and visitors alike to explore. 10. The Pit BBQ’s Community Growing – This Raleigh, NC (corrected from Cary, NC) local restaurant used Foursquare early on to grow a community with it’s patrons and invest in word of mouth. They reached out via Twitter and Foursquare to their most social users and used these opportunities to reward these users. 11. Coach Men’s Store Cologne Giveaway – For opening weekend of their Men’s Store in NYC, Coach gave away free cologne ($85 value) to the first 200 customers who checked into the store on Foursquare. 10% of the traffic to the store that weekend came with Foursquare check ins. Causation or correlation is tough to say, but it looks like the promotion helped drive awareness and buzz for Coach’s first Men’s store launch. 12. The Today Show – “Foursquare users who head to 30 Rock this summer for the Toyota Concert Series on Today will be able to check in, earn badges and compete for mayorships… The Today Show also has three custom badges that visitors can earn: the Newbie badge for first check ins, a “Roker” badge for three check ins and a “10 to 10″ badge for those that check in at the Plaza concert series 10 times or more. Follow the link to see the live TV announcement with Al Roker explaining the promotion. 13. AJ Bombers “I’m on a Boat” Badge Party – Local restaurant taps into area Foursquare users passionate about their badge earning and creates events based around earning some of the more difficult ones, the Swarm Badge (50+ people) and the I’m on a Boat badge. He saw some great increased sales numbers and got some great free exposure. 14. 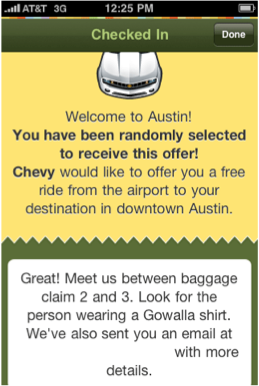 Airport Rides with Chevy and Gowalla – Chevy and Gowalla partnered up at SXSW 2010 in Austin, TX to give users that checked in when they arrived at the airport, free Chevy car service downtown to their hotels. 15. The Nets Leave Free Tickets at Sports Locations – The New York Nets hid free pairs of virtual game tickets throughout New York City sports related check in spots, like sports bars, parks and gyms. The virtual tickets could be exchanged for real tickets to a specific game, which 15% of people did. Attendees won t-shirts and the chance for other prizes. 18. Rock and Roll History Across the Country – Whrrl partnered “with Paul Allen’s Seattle-based Experience Music Project to bring the history of rock and roll to Whrrl check ins in 6 cities across the country. If you visit the Experience Music Project (EMP) in Seattle, you’ll see napkins from hotels where Jimi Hendrix wrote the lyrics to some of his most famous songs. Now on Whrrl you can learn what inspired Hendrix when he wrote those lyrics. 19. Graduation Ceremony Mass Check In – To celebrate their 125th anniversary, St. Edward’s University had over 180students, parents and faculty check in and share photos and comments from their graduation ceremony on May 8th. Instead of having students share their day, separately, through Facebook and Twitter from their phones, St. Edward’s decided to use Whrrl so their students could all connect their cameras and share their perspectives. 21. 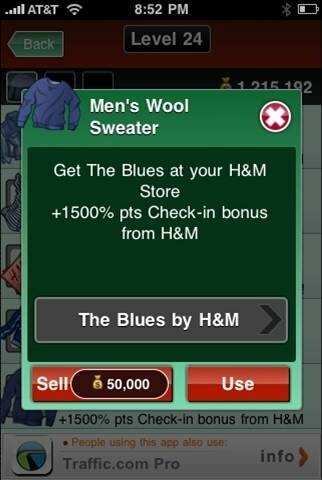 H&M Virtual Goods – H&M provides virtual versions of their products to players of MyTown in an effort to incentivize players who are near H&M by giving them special “Blue” clothing items as they approach the store.